The International Energy Agency has released a new report World Energy Outlook 2011 on the evaluation of the realities and prospects of world energy. Russia has once again taken its place in the energy "crowd": no hopes, no expectations. According to the report World Energy Outlook 2011 (http://www.eia.gov/forecasts/ieo/) by the International Energy Agency (IEA), despite the fact that the world continues to recover from the global economic downturn 2008-2009, the recovery is uneven. In advanced economies, economic renaissance is slow. Against this background, the growth in countries with emerging economies (including, Russia) seems high. However, this is often related not to successful management and smart energy policy, but to high commodity prices. 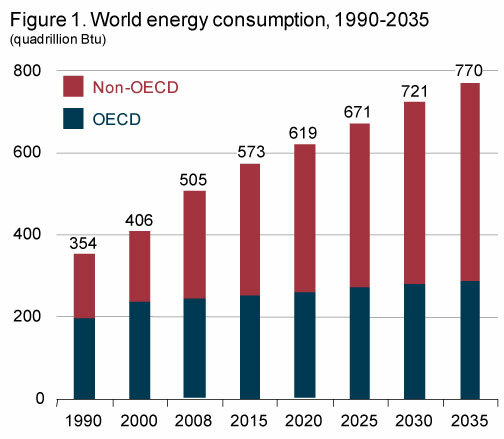 According to IEA experts, the global energy market will grow by 53% from 2008 to 2035. Moreover, most of the energy consumption growth (85%) will be in countries outside the Organization for Economic Cooperation and Development (OECD). The report also notes that the share of renewable energy sources (RES) of total global electricity production will increase by 2035 up to 15% (from 3% in 2009), and subsidies for renewable energy development in this period will increase by five times - up to 180 billion of dollars. IEA experts note that the uncertainty associated with the energy perspectives will become increasingly worse. Social and political unrest in the Middle East and Africa cause growth of oil prices. According to the scientists, price hikes are fraught with power outages of entire regions and significantly add to the uncertainty in the short term. Another cause of uncertainty, according to the authors of the World Energy Outlook 2011, are the consequences of the major accident at the Fukushima Daiichi nuclear power plant. Although this catastrophe has not affected the global projections of nuclear energy, the report notes that "the event may have more profound implications for the future of world energy." This phrase can be called more than cautious, because a sufficiently large number of countries have adjusted their energy policies not in favor of the development of nuclear technologies. According to the IEA, the "carbon price" will help to reduce the share of renewable energy in total primary energy demand up to 10% by 2035. The report says that every dollar not spent on greenhouse gas emissions reductions in the energy sector before 2020 will require spending 4.3 dollars after that date to compensate for previous inaction. Despite the important role of Russia in the global energy sector, experts do not place much hope and expectations of the country. Russia appears in the report as a major exporter of gas, but as not a very big player in the oil market, its stocks being estimated at 4% of the world total. According to the experts, Russia will not move far in reducing CO2 emissions. By 2035, they predict even a small increase (0.2%). Experts predict an increase in coal use by 0.6%, occurring against the backdrop of a convincing reduction of the role of this type of energy in Europe. Forecasts for the prospects for renewable energy development in Russia are not impressive. The production of electricity from hydropower and other renewable energy sources by 2035 in Russia is expected to increase by 1.6%. Of course, the International Energy Agency forecasts are only one of the options for energy vision. However, it is clear that it is a direct reflection of the country's energy policies, which are not particularly ambitious and promising. "Countries should make efforts to ensure global energy demand through sustainable and low carbon solutions ... Do not wait for a global agreement, act today. You can and should implement the best solutions to provide affordable energy to your citizens" - Maria van der Hoeven, the executive director of the International Energy Agency appeals to politicians. She noted that the IEA is now offering a series of such decisions, including measures to improve energy efficiency, renewable energy development and market mechanisms to reduce greenhouse gas emissions. "Let us remember that the solution to climate change is compatible with the provision of affordable energy," - she notes.